2018 marks the 65th year for the Christmas Ship Parade on the Columbia and Willamette Rivers in Portland, Oregon. The Christmas Ship Fleet cruises between both rivers offering the Portland area thrilling Christmas time parades. 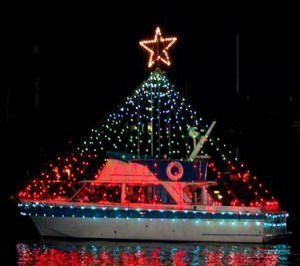 The Portland tradition that started with one decorated boat it a volunteer organization. The privately owned vessels come from Portland, Vancouver, McMinnville, Salem and Hood River areas. Some of the ships owners have been part of Christmas tradition for more than 30 years with many being part of the fleets for over 20 years. Join Portland Spirit to make this your holiday tradition! Join us for a Willamette River cruise for front row seats to see the Christmas Ships a two and a half hour cruise, three course plated meal, live entertainment and fully enclosed and climate controlled decks. We make every effort to provide a good view of the Christmas Ship Fleet. Parade viewing can not be guaranteed due to potential river activity and conditions. I lived and Portland for a while now and have never been aboard for a cruise. This sounds like a lot of fun and a great way to enjoy Christmas. It would nice to attend!